Does 3D TV really make sense on a smaller screen? Panasonic seems to believe so, launching two 3D LCD tellies into the sub 40-inch mass market. Not that the TX-L37DT30 reviewed here, and its 32in TX-L37DT30 sibling, are just about 3D. 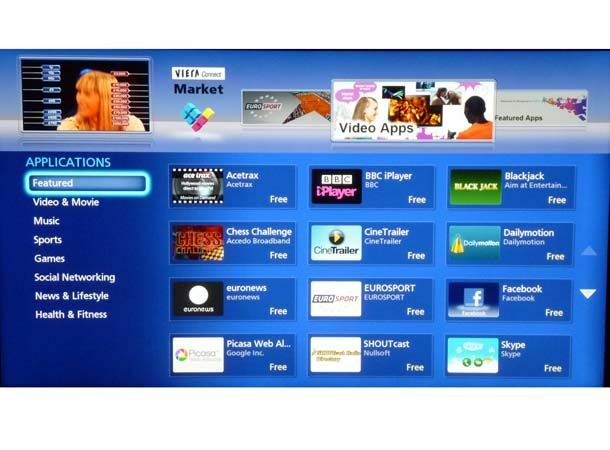 They also offer advanced networking with access to the newly opened cloud-based VIERA Connect IPTV and apps service. This is a beautifully made TV, with trendy titanium edging and glossy black frame. Connectivity is à la mode too. Three HDMI inputs, Scart, a PC mini D-sub, component, Ethernet LAN and twin USB ports should cover most eventualities, but should you need more there's also a side-mounted fourth HDMI input, third USB slot, phono AV plugs and SD card reader. Notably though, there's no integrated Wi-Fi. The TX-L37DT30 connects to the net via the brand's VEIRA Connect IPTV platform. Key attractions here include BBC iPlayer, YouTube, Skype video-calling, Facebook and Twitter. They are joined by games and content from the adjoining VIERA Market apps store. It's a good spread. The set's other trump talent is streaming media. Once networked this DLNA set spotted all our media servers, and was able to access content in every key video format and wrapper: AVCHD, DivX, AVI, MKV, MP4 and MOV and MPEG. Musical support extends to MP3, WMA and AAC. Significantly, the TV plays back music with album art and metadata in tact. Pointedly, Samsung's 55UED8000, when streaming music from the same servers, could do neither. This broad compatibility extends to media on USB flash drives. There may be no 3D glasses in the box (a cheapskate move) but this set is fully 3D compliant. We auditioned it using Panasonic's new £130 TY-EW3D2LE glasses which are a darn sight more comfortable than the brand's first generation bins. Dimensionally speaking, this set rocks. We spotted double image crosstalk on contrasty subjects, but it's not intrusive. Part of this is down to the speed of the panel itself, and part down to the fact that the smaller screen size masks minor double-imaging. Colours remain vivid and depth FX are well defined. The set's 2D-to-3D conversion technology works reasonably well, although results can be unpredictable. 2D picture performance is fine but not fierce. Unlike the cheaper TX-LD37E30 screen, this model has Edge LED back-lighting top and bottom, which makes it susceptible to colour and contrast wash-out when viewed vertically off-axis. You'll also need to engage the 400Hz IFC (Intelligent Frame Creation processor); without it motion resolution is woeful. Mid is my recommended IFC setting, any higher and motion artefacts shroud objects. Elsewhere, the TV has both Freeview HD and Freesat HD tuners, which gives maximum reception flexibility. Audience performance is serviceable. The set gets a little sibilant when driven too loud, and there's no subwoofer. Panasonic's first 3D LED TV may arrive on the coat-tails of the brand's award-winning 3D plasmas, but it doesn't disappoint. 3D imaging is punchy, with enviably low crosstalk. 2D hi-def picture performance is fine, but I actually prefer the cheaper E30 model which offers superior off axis viewing. Media compatibility and IPTV access should be considered best in class.